If you’re looking for quality cabinets from a trusted team of kitchen manufacturers in Perth then you’ve come to the right place. Woodcraft Designs takes great pride in bringing a smile to the faces of countless Perth homeowners in search of dependable service courtesy of world-class kitchen designs in Perth. The cornerstone of our success has been our ability to take inspiration from your ideas and lifestyle, matching them and applying them effortlessly to your kitchen space. For kitchen designs that cater to every last detail, including your budget and deadlines, contact us today. Our rich history of kitchen design and renovation has allowed us to build a wealth of experience across a variety of clients. This means that, whether you’re a business or a home, we can help you craft the modern kitchen designs you want at a price that won’t break the bank. Our dedicated team is on hand and available to discuss your needs and take you through our proven service process so that you can enjoy the ideal kitchen today. What we consider when carrying out a kitchen renovation? Part and parcel of our approach to delivering the results you want is understanding you. This especially includes your budget. We believe in keeping you informed before and during the whole process so you are never left in the dark about how much you’re spending and what you’re spending it on. Before we commence with any work we will break down the costs associated with your project so that we stay within budget and avoid any surprises. We make designer kitchens an affordable reality. Your day-to-day lifestyle, habits and preferences are a critical component of kitchen renovation success. In order to ensure you get real value for money our designers will ensure they have an in-depth understanding of life at home and your ideal kitchen. This is our sure-fire way to providing a solution that suits not only your lifestyle now but in the future too. Looks may not be everything but they are important for maintaining the kind of atmosphere you want to create. Our experts will strike the delicate balance between style, texture, colour and even lighting to make sure that your kitchen is the envy of all your guests, visitors and neighbours. Equally as important as being pleasing to the eye is ensuring that your kitchen space makes moving around the kitchen straightforward and cooking that much easier. We make this happen by matching form to function and effectively using the space allocated to your kitchen. We’ll work with a layout that complements the space available, your appliances and the capacity for storage available. It can be quite daunting to picture redoing your kitchen, especially when considering the cost and time taken to achieve the look you envision. You don’t have to worry because as experts in kitchen renovation we’ve learnt how to reshape and rejuvenate kitchen areas with minimal fuss, disruption to daily life and cost. Our most popular solution is a simple yet effective one – custom kitchen cabinets. 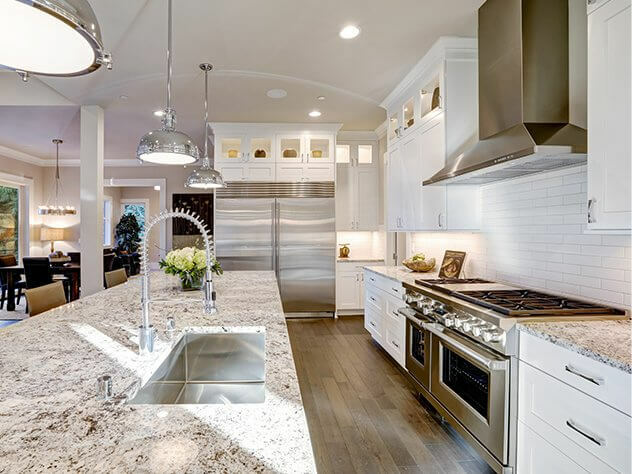 This is because kitchen cabinets allow for very little in the way of changing the physical layout of your kitchen; however, the entire look and feel can still be given a makeover through well thought out aesthetic adjustments to just the cabinets. Get in touch today to discuss a host of custom kitchen cabinets design ideas.